I loved every moment of reading this wonderfully original book and wished it didn’t have to end. I’ve never given much thought to the life of a night porter (told in the first person we never find out his name) in a full service hotel before but this innovative work opened my eyes to the lifestyle of a truly dedicated one and the unusual world he occupies. I say occupies as if this is his life rather than a job but he is so dedicated it is in fact his life. I bought the ebook version of this book and was just about to start it when I was given a copy of the paperback by the author and I was so pleased to read this instead. The paperback is a glorious thing, matte covered with creamy pages and spectacularly formatted with the inclusion of footnotes which I thoroughly enjoyed. I know some may find that they interrupt the reading but I didn’t find that at all. I enjoyed the little asides, the juicy extras as the story progressed and the final one was for me a deliciously perfect end. The Night Porter is a professional in every way, in his attitude and in his attire – which is immaculate. Everything speaks of someone who is at the peak of their profession, is proud of it and wishes to keep it that way. He is given the task of tending to the needs, the requests and the every whim of four very different authors who come to stay at the Saladin for two weeks prior to the Arkwright Awards that each has been nominated for. 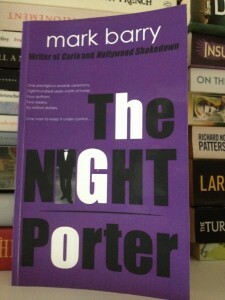 The Night Porter is not a reader and knows nothing of the writing world but over these two weeks his eyes are opened. He is an observer, a people watcher and he interacts with each of the authors in different ways as the story progresses never being anything other than his diplomatic and discrete self. A friend to all he is in fact a star.